We offer ski weekends and flexible, tailor-made short breaks to Austria. With our extensive local knowledge, our aim is to match your requirements with our resorts and hotels to ensure you enjoy maximum skiing time with minimum hassle. Much as we would love to, we do not promise any date, duration in any resort. However, we know exactly what works, we understand the limitations of short stay availability in Austria and have excellent relationships with hotels that offer us just the right balance of flexibility. Our packages usually include the accommodation and airport transfer element to which we or you can add flights. We offer a wide choice of Hotel options including Luxury Spa Hotels and we can pre-book lift passes, hire, private lessons or guides in advance. Planning your Ski Weekend : Where to go? The resorts of the Kitzbüheler Alps region (Fieberbrunn, Kitzbühel, Kirchberg and St Johann in Tirol) offer a great variety of skiing, the best choice of flexible hotel options and resorts close to a number of airports. From Salzburg, Zell am See and Kaprun have some great short stay options whilst Saalbach-Hinterglemm is more limited. Innsbruck offers the best access to Stubai (Austria’s largest glacier resort, short transfer), Sölden (Big skiing, big après-ski, limited short stay options) and St Anton (very limited weekend options and premium prices). Unfortunately, the bigger and more well-known the resort, the less flexible hotels are likely to be and this is certainly the case in the likes of St Anton and Ischgl where most hotels book out Saturday-Saturday. Almost without exception, hotels only accept 7-night stays in the high season (New Year, February School holidays). For the best ski weekend availability, aim for pre-Christmas, January, early February, March and April. You may want to consider arriving on a Saturday or Sunday for 3 or 4 nights rather than over a weekend. A Sunday-Wednesday break, for example, offers less crowded slopes and keener prices. The more flexible you are, the more Hotel and Resort options are available. Salzburg, Innsbruck and Munich (Germany) are the main gateway airports to the Austrian Alps. Salzburg and Innsbruck offer the shortest transfer times however, Munich offers the best choice of flight times, in particular, late flights home on your last day for max skiing time. Our packages usually include Accommodation and Airport Transfers. We offer either shuttle or private small group minibus taxi or coach transfers that ensure waiting time is kept to a minimum. Transfers by train or hire car are also an option albeit more time consuming. We can advise on the best flight routes, times and fares or you are welcome to book your own flights. Whether you are rewarding your team, entertaining clients or wish to host an off-site conference with a difference, the Austrian Alps provide a stunning backdrop and playground. 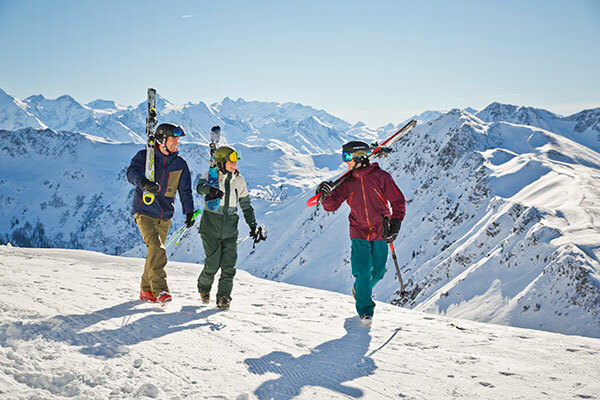 Our corporate Ski weekends are tailored to meet your requirements including organising flights, exclusive transfers, flexible group and individual itineraries, resorts and hotels to match your aims and budgets and a wide choice of off-slope resort activities. We have been organising flexible, tailor made holidays to Austria since 1999. From the right flight times to the right airport, the best transfer options and resort and hotel best suited to you and your party, we are here to help. These prices are a low season guide price per person based on 2 sharing and include 3 nights accommodation as described and return airport transfers from Salzburg or Innsbruck (minimum 4 share, minibus taxi shuttle). Flights are extra. Please contact our office or you can book your own flights. Private or Munich transfers, 4*+ Luxury Spa Hotels or longer durations will increase these prices. As all of our ski weekends and short breaks are tailor-made in terms of resort, hotel and duration, please contact us here with your requirements.